Summary: When Adam’s grandfather, David McLean, dies and leaves a quest for each of his seven grandsons to complete, Adam is torn between mourning his loss, intrigue about the quest, and bitterness about overhearing his grandfather telling his mother he will never amount to much. His trip to France to take care of some his grandfather’s unfinished business challenges Adam to prove his grandfather wrong, but he finds himself facing the same moral quandaries that his grandfather did decades before. One thing is for sure, the quests left by his grandfather will change Adam in ways he never expected. Review: I loved Last Message by Shane Peacock. Adam is an observant yet sensitive character placed in a story that is well-paced and page-turning. I enjoyed the conflict between Adam and his dead grandfather over a misheard comment, but the best part was that Adam was ultimately trying to prove himself to himself. He needed to know that he was more than just okay, and that being okay in his case ends up being pretty great. Plus, I’m a sucker for stories where characters end up realising and appreciating what they have. In the beginning, Adam is chasing after Vanessa because he thinks a relationship with her will make him more than just okay, except as events unfold he starts to understand that his current girlfriend and best friend are real people who care about him as he is because he is already the whole package. Throw in a trip to France (! ), a three part quest that challenges Adam to step up and make some mature decisions and some witty comments about the differences between Canadians and Americans and it’s a book you won’t be able to put down. As in Close to the Heel by Norah McClintock, David McLean proves to be an incredibly wise grandfather who knows just what his grandsons need to help them become the amazing men they are capable of being. Can’t wait to read another book from Seven the Series, and I just might put Peacock’s The Boy Sherlock Holmes series on my personal reading list as well. 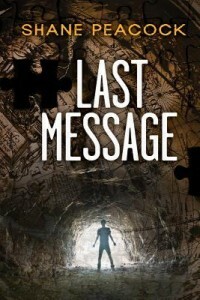 Last Message by Shane Peacock is published by Orca Book Publishers, (2012).